There’s not a student alive who wouldn’t love to get higher grades than anyone else while studying LESS than most other people. In this 3-hour live class, students ages 12–26 learn the advanced studying, test-taking, and paper-writing strategies that top students use to succeed at the most prestigious colleges in the country while still having plenty of time left over for leadership, interning, and having more fun than they ever thought possible. Students leave at the end armed with a systematic review method developed at Carnegie Mellon University that can completely eliminate the need to ever cram for exams. Are you a student age 12–26? 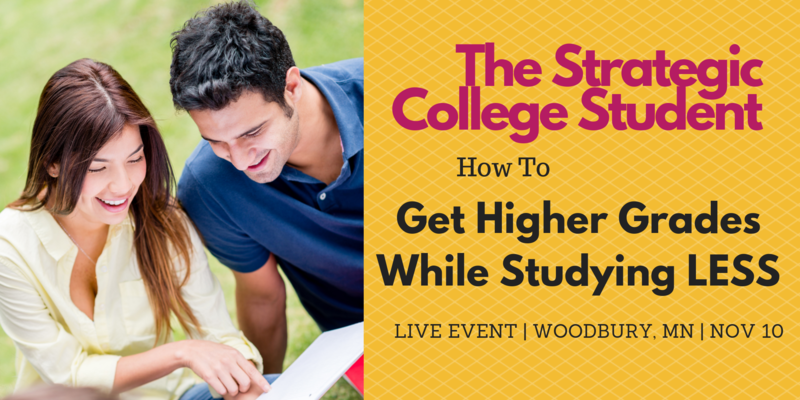 This class will help you to maximize your potential in high school and in college, give you more time to relax, and help you to become a top contender both for scholarships, and for career or grad school success after college. The class is ideal for current high school students, middle school students, current college students, graduate students, and teens who’ll be starting dual enrollment college courses this coming fall. Parents are encouraged to attend as well. Look at what others are saying about this class! This class is presented just twice each year. Can’t make this one? Subscribe to Jeannie Burlowski’s free weekly email newsletter at JeannieBurlowski.com, “whitelist” the newsletter using the instructions here, and you’ll be notified of your next opportunity to register. Most parents don’t realize it, but middle schoolers’ brains are developing faster than at any time since infancy. Age 12, 13, or 14 is the perfect time for students to first get exposure to the strategies that top-performing college students use to manage time so they can study LESS than most other people. Middle schoolers eagerly devour the information in this class, and then use what they learn to get higher grades all through high school. Bringing a middle schooler to an event like this is an opportunity that should not be missed. Absolutely, yes. This class will relieve your stress and anxiety, make your dual enrollment classes far easier for you to manage, and set you up to have the highest possible college GPA when you either go looking for post-college jobs or apply to grad school one day. Many students who’ve taken this class as middle schoolers take it again just before starting dual enrollment college classes in high school. Yes. This class is ideal for any student, age 12–26 and up, who would like to achieve more while giving less time to studying. If possible, yes; please do. Parents are strongly encouraged (but not required) to attend this class. The reason? If your child begins to flounder academically at any point in the future, you’ll be able to say, “Remember that ________ strategy we learned from Jeannie Burlowski? Are you still using that one?” This class will help you to be your child’s greatest encourager and cheerleader during the college years. No. The strategies in this 3-hour class are not taught in high school. What a great idea! Take a look at the inspiring, helpful article Jeannie Burlowski has written on this exact subject here. You can email the organizer of this event at brilliantincollege@gmail.com.